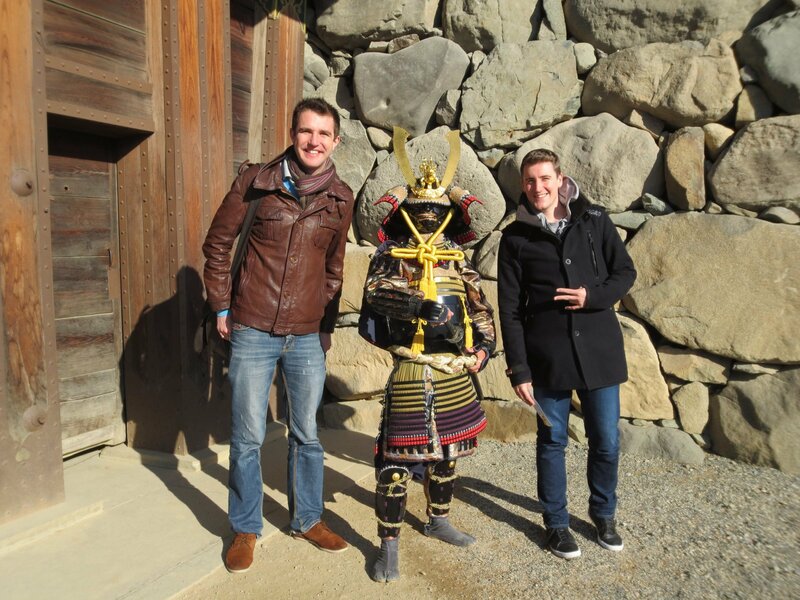 Ask almost anybody at InsideJapan Tours what is their favourite thing about Japan, and they will probably list the people, the food, and the onsen. Heck, ask any Japanese person what is their favourite thing about Japan and they’ll most likely say the same. And yet for such a well-loved pastime, onsen are also probably the scariest part of Japanese culture for most foreigners. 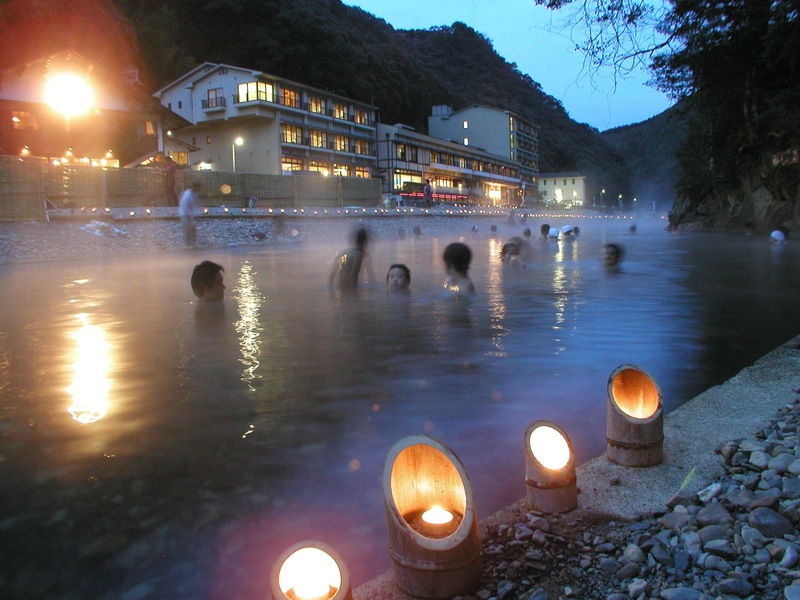 But don’t worry – after reading this guide, you too will be an onsen master! First things first! An onsen 温泉 (lit. “hot water spring”) is a natural hot spring bath, and thanks to its plentiful volcanic activity Japan has lots of them. 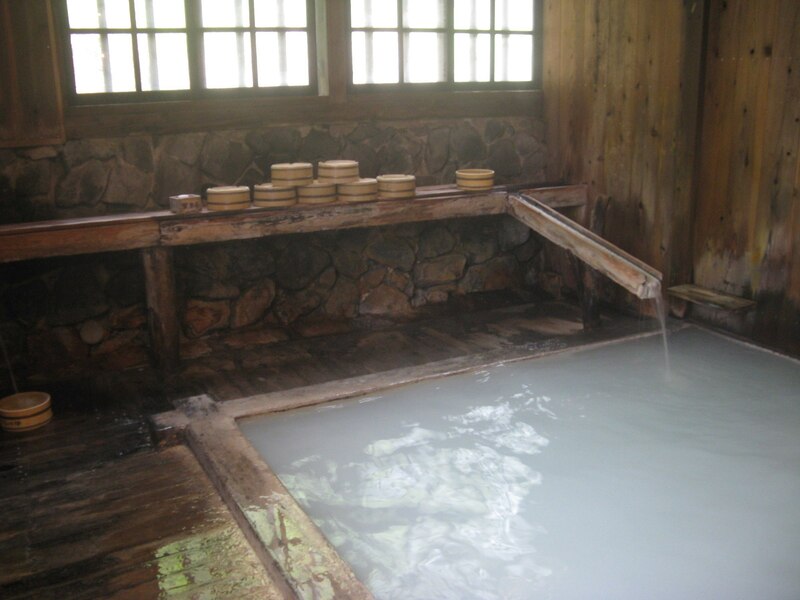 Onsen water is geothermally heated beneath the ground and rises to the surface bubbling hot. The prerequisites of an official onsen are that the water must contain at least one of the 19 designated chemical elements that naturally occur in hot spring water, and it must be at least 25C when it comes out of the ground. Rotenburo is another word you may hear in Japan and refers to an outdoors onsen (the best kind!). Sento, on the other hand, are indoor public bathhouses supplied by ordinary heated water. Whilst onsen are generally looked on as something as a treat, sento are the everyday bathhouses of ordinary Japanese people – and as such make a very interesting experience in themselves, although sometimes it can be a bit daunting to enter on your own as very few foreigners take the time to seek them out. Nevertheless, the rules of etiquette are the same for both onsen and sento, so with your newfound skills you’ll be able to tackle any bathhouse with aplomb. Communal bathing doesn’t exactly sound appealing to most gaijin (foreigners), but in Japan it is a beloved part of traditional culture. 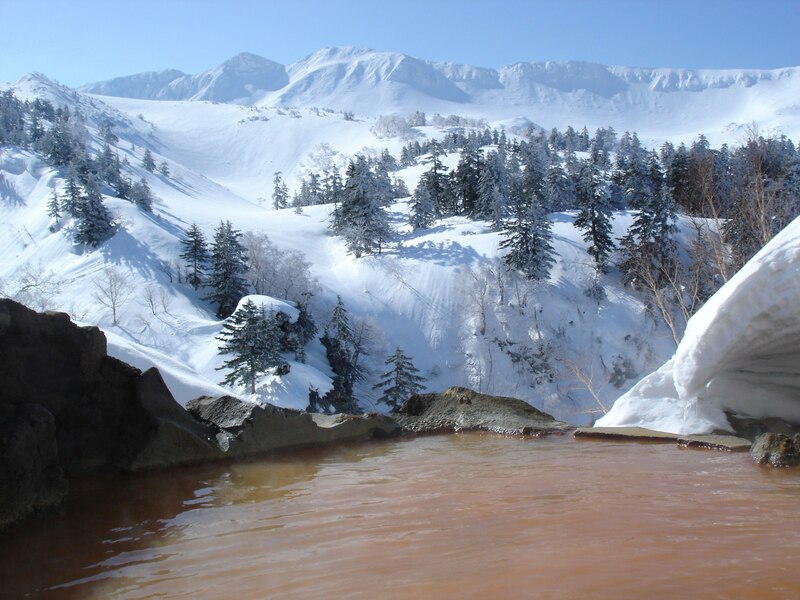 Onsen water has been believed to have a multitude of healing properties basically since time began, and is packed full of minerals that are thought to be good for your skin, circulation and general health. 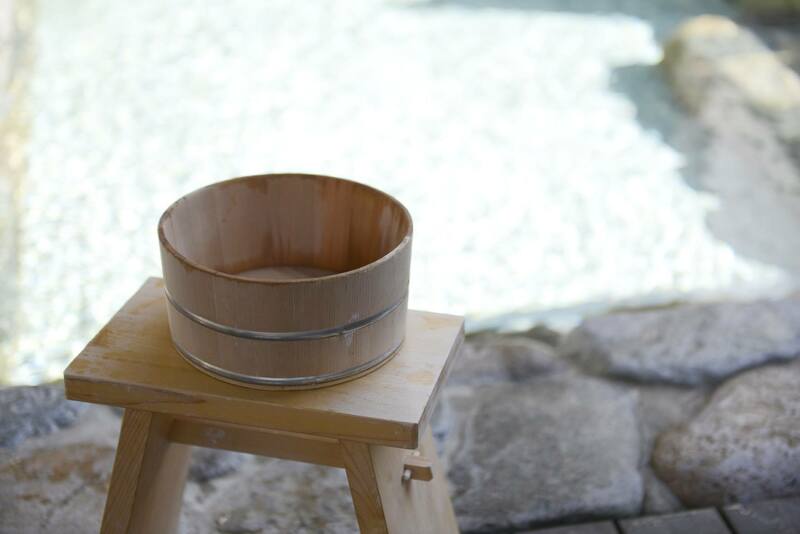 Onsen baths can be beautiful objects in themselves – made from materials such as cypress wood, marble and granite – and are often situated in areas of outstanding natural beauty or attached to lovely traditional inns, which enhances their appeal. There really is nothing more relaxing or therapeutic than lying back in a hot bath after a long day – especially when you’re surrounded by falling snow, on a beach, overlooking a beautiful mountain view, or listening to a river rushing past. Once you’ve done it, you’ll never look back! There are quite a few rules of etiquette surrounding onsen bathing, and this can make the whole thing seem a little scary and uncomfortable when you’re not sure what you’re doing – but once you’ve done it once you’ll realise that it’s really not that complicated after all. For those who really can’t stomach the idea of stripping off in public, there are a number of ways you can get around it. 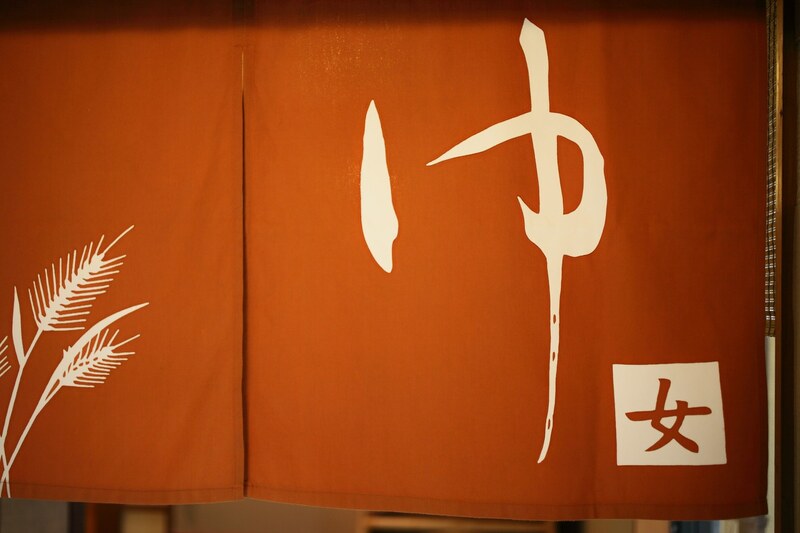 For one, there are many traditional ryokan inns where the guest rooms have private rotenburo baths attached (these will be amongst the more expensive rooms), and in some inns the public baths are available for private use on request. Another alternative is to visit an onsen with milky water – once you’re in, nobody can see anything! 2. Shower before you bathe. To the Japanese, the Western practice of washing yourself in the bath is, well… pretty gross actually! Even when bathing in the privacy of their own home, the Japanese always clean themselves under the shower before having a soak in the bath – and this is even more important when you’re visiting a communal sento or onsen – to keep the water as clean as possible. To this end, every onsen has a row of showers around the outside of the bath. Soap, shampoo and conditioner are usually provided (though you can bring your own if you prefer), and you are expected to sit down on one of the stools provided while you wash. It’s considered bad manners to stand up while you wash, as you might splash one of the people next to you – and you must remember to rinse thoroughly so as not to get soap in the bath water. Though it’s less important than showering before you bathe, most Japanese will have a quick rinse under the shower after a soak in the onsen – and if they are returning to the bath after using a sauna or steam room. At any onsen, you will either be provided with a small and a large towel, or there will be some available to rent. This is not always the case at local sento baths, so you are advised to bring your own. The large towel is for drying yourself and should be left in the changing room (along with your clothes), while the small towel is for washing and can be taken into the bathing area. You can take your small towel into the bath with you (in fact, many people put them on their heads!) but you mustn’t let it go in the water. If you have long hair, always remember to bring a hairband or to wrap your hair in a small towel, as even if you’ve just washed your hair under the shower – you should take care to make sure that it doesn’t go in the bath water. You wouldn’t want to be sitting around amongst other people’s hairballs, would you? Well that’s why. In fact, even if you don’t have any hair you should refrain from putting your head underwater, as there is always a small chance that shared water may carry infection, and putting your head underwater increases your risk of catching something. As I explained in a recent post, tattoos are something of a taboo in Japan – thanks for the most part to their association with Japanese organised crime (the yakuza). 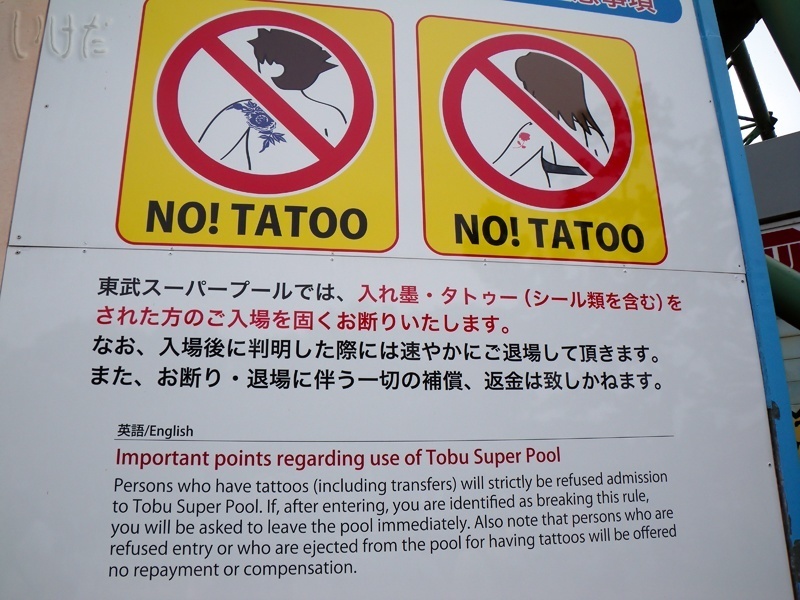 Unfortunately, this means that most onsen and sento ban tattoos completely – even if it is blatantly clear that you are not part of the mafia. It doesn’t make much sense, but rules is rules! If you have a small tattoo, you may well get away without anybody noticing – or you can cover it up with a sticking plaster or bandage. If you have a larger tattoo that’s difficult to cover you may have more problems. Some solutions are to stay at ryokan inns where there are private rotenburo baths or onsen that can be rented for private use, or to head to the hotel onsen late at night after the other guests have dispersed. If you’re very brave, you could even find out where the real yakuza bathhouses are – but we’re not going to recommend it! Bathhouses are social places, and most onsen-goers like to have a bit of a chat while they relax – so as long as you’re not being rowdy you certainly don’t need to worry about making too much noise. Onsen and sento will generally display signs indicating that you should not drink and bathe – for pretty obvious reasons I think. That said, a cup of sake or a cold beer while you soak can be divine, so if you’ve got your own private rotenburo then I say go right ahead!